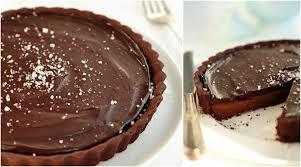 This chocolate caramel tart is absolutely amazing. A buttery almond crust, gooey salted caramel and bittersweet chocolate ganache, all garnished with salted crystals. Chocolaty, rich and buttery, I fell in love with it from the first bite. Love the salt crystals as they don’t melt immediately and let you taste the sweet, the salty and the bitter at the same time. 3. On a floured surface or over the plastic wrap roll the dough to a circle with about 1 1/2 inches larger than your tart pan. Lift up the rolled dough and place it on a greased 9 inch tart pan. Remove the edges and refrigerate for 30 minutes before baking.